Ukrainian opposition calls January 16 events in parliament "Black Thursday"
The Ukrainian opposition is extremely disappointed by the events in the Verkhovna Rada on January 16, which it believes will go down in history as "Black Thursday" for Ukraine. "This is a demonstrative transition to a dictatorship where there is no right to assemble, to reason, to live, where there is no law, no civil rights, and no legal process. This is not a situational neglect of the laws, the Constitution, and common sense. This is a coup for which both its organizers and actors must be punished," the Batkivschyna parliamentary faction said in a statement posted on the opposition party's Web site. All of the laws in favor of which the Party of Regions' faction members raised their hands in parliament on January 16 - "and no one was going to count them anyway - must be annulled as if (they were) not passed," the Batkivschyna Party said. "The Verkhovna Rada must return into the constitutional field… If this does not happen, it will mean that in Ukraine the Constitution, the parliament and the laws will not be effective and court rulings will not be enforceable," the statement said. The parliamentary majority effectively committed a coup, Svoboda (Freedom) Party faction leader Oleh Tiahnybok said. "Effectively, this is a coup. Neither the head of parliament, nor the president has any right to sign what was ostensibly passed," he said, commenting on the passing of legislation in the session hall on Thursday. "Today Ukrainian parliamentarianism is dead," Tiahnybok was quoted as saying by the Svoboda spokesperson. "What happened within the Verkhovna Rada walls is an absolute farce, a demonstration of the total usurpation of power... Effectively, the regime is leading the country into a civil standoff. Yanukovych's authorities will definitely be accountable for that," he said. It was reported that on Thursday the Verkhovna Rada voted for the 2014 state budget without a debate. MPs also passed other important resolutions. 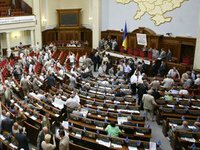 They had to vote by the show of hands as opposition parliamentarians seized voting cards from parliamentary majority members, thus obstructing the vote through the Rada electronic system. The bills were voted upon without a debate, and the opportunity to read the documents only arose after these were passed by parliament.